If your SmartMedia card doesn't work in your Olympus camera anymore then it's probably because you used your PC to delete some files off it, to write to it, or to format it. Sometimes the formatting gets corrupted if you didn't dismount the card correctly too. This is not a good idea, as any of these processes can upset the physical formatting of the card and the Olympus will then not read the card at all and won't even let you reformat it. This is because Olympus are being greedy and forcing you to buy their SmartMedia cards if you want the Panoramic fuunctionality. There is no fundamental difference in the cards other than about 12 bytes of data in the CIS header information on the card, which is not easy to see. Because of this extra data, when you format a card on an Olympus camera it doesn't do it properly, and only does a high-level format, not a low-level format. Note that Windows ignores the low-level formatting completely (and when re-formating), which is why your card probably still works in Windows, just not in the camera. 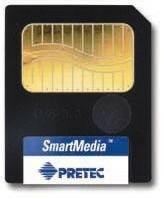 If your card has lost its format irretreivably then you need to put your SmartMedia card into a PC based SmartMedia reader and run a program called SMPREP.EXE to do a low-level format. This program is supplied with many SmartMedia readers, but not all. However, using this program deletes the ability of the SmartMedia card to work with the Olympus Panoramic function, as this requires a special formatting to be applied. The SMPREP.EXE file can be modified though, so that it will write the correct Olympus Panoramic format, and this is what I have done here. You can also use these programmes to turn a non-Panormaic card into a Panaoramic one. There is plenty of information on the net telling you all this (do a Google search for smprep.exe, or for smartmedia olympus format, etc), but it is really really difficult to find (a) a copy of SMPREP.EXE on the internet, and (b) a free HEX editor to edit the program. The first program deliberately BREAKS the low level formatting on your SmartMedia Card, which is necessary so that the Second program will enforce that a new one be re-written, but with the Olympus Panoramic header on it (as the 2nd file has been modified to write the Panoramic header). Use these at your own risk, and only after reading as much as you can about the process elsewhere (start with the third file here). If all this sounds too risky for you, and there is a risk of damaging the SmartMedia card, then the above web page archive also has a link to a service that will do it for you, at a cost. If your SmartMedia card won't work on your Olympus then you've probably run out of options and the risk of running this program against your card is one you will probably feel you have to take. However, if you have a fully functional SmartMedia card and you are only trying to convert it to Panoramic functionality then obviously the consequence of failure is higher, but that's your call. They worked for me, mending one card and converting another, but I make no promises other than the fact that I have virus checked these programs with an upto date virus checker as at 26th September 2004, the day that I uploaded them. Many thanks to the entire internet Olympus/SmartMedia community which did eventually solve my problem. Eventually. Update: Some people report getting the error message "smartmedia drivers are not loaded" when running the above programs. I think these programs may only work with some makes of Smartmedia reader hardware, but I'm not certain. One person has commented that it only worked when they saved the smprep.exe files into the same directory that held the drivers for their SmartMedia card reader, which was for a "danelec" model. I'd really appreciate hearing from anyone for whom this program has worked, especially anyone who had this error but then found a way to solve it. If this program and webpage have helped you to mend your Smartmedia Card or to add Panoramic functionality to one of your cards, then please consider making a small donation by clicking the button below. This will also let me know how many people out there are finding this page useful. Many Thanks.